The Militia Battalions of the Royal Irish Fusiliers included the 3rd Battalion, late Armagh Light Infantry Militia. The head-quarters were at Armagh. The 3rd Battalion of The Bedfordshire Regiment was formerly the Bedfordshire Light Infantry Militia and bore on its colours the motto, Pro Aris et Focis. Colonel Sir J. M. Burgoyne, Bart., in his history of the battalion, states that, according to officers present, a large proportion of the men of the late 3rd Battalion 14th Foot who fell at Waterloo were found to be wearing the appointments of the Bedfordshire and Berkshire Militia, but that no Militia is extant of the former having given any volunteers o the line at the time. It may be interesting here to note that the muster-rolls of the 14th Foot, preserved among the War Office records, show that regiment to have received a large draft of volunteers from the Bedfordshire Militia (later 3rd Bedfordshire) in the spring of 1813, many of whom fell on the memorable 18th June. 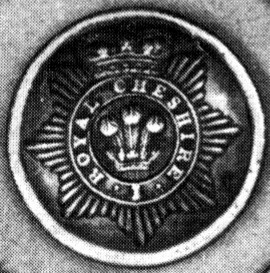 The 3rd Battalion of The Cheshire Regiment was formerly the 1st Royal Cheshire Light Infantry Militia. The head-quarters were at Chester. The Dublin County Light Infantry. 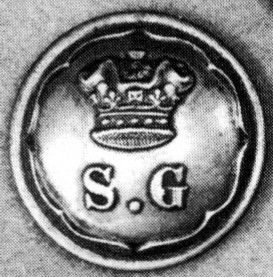 Glengarry badge, post-1881. 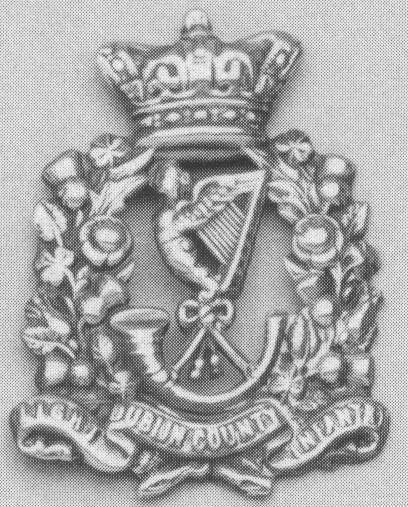 The Dublin County Militia was formed in 1793 and redesignated Dublin County Light Infantry in 1855. In 1881 it became the 5th Bn of The Royal Dublin Fusiliers. Headquarters were in Dublin. Book: DUDGEON, Major R. C. History of the Edinburgh, or Queens Regiment Light Infantry Militia (now) Third Battalion the Royal Scots; with account of the origin and progress of the Militia, and a brief sketch of the old Royal Scots. Edinburgh: William Blackwood and Sons, 1882. xvii, 184pp. 4 cold ptd & 5 other plts. The 3rd Battalion of The Royal Inniskilling Fusiliers was formerly the Fermanagh Light Infantry Militia with head-quarters at Omagh. The 6th Battalion of The King's Royal Rifle Corps was disbanded in 1889. It was formerly the Royal Flint Militia Rifles, previously the Flint Light Infantry Militia, the oldest light battalion in the Militia, raised as the Flint Militia in 1763. 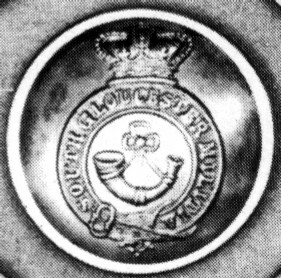 The 3rd Battalion of The Welsh Regiment was formerly the Royal Glamorgan Light Infantry Militia. The head-quarters were at Cardiff. The 3rd Battalion of The Gloucestershire Regiment was formerly the Royal South Gloucester Light Infantry Militia. The head-quarters were at Bristol. 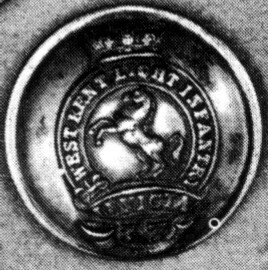 The 3rd Battalion of the Queen's Own (Royal West Kent Regiment) was formerly the West Kent Light Infantry Militia and they displayed only the White Horse of Kent, and motto. Its head-quarters were at Maidstone.